- The science behind the time travel... sigh. - So it seems that Vipers are definitely capable of carrying two people after all. - Mortinson: "Walls do not a prison make." - The little boy showing his father the Viper. - Boomer as the XO of Galactica! - The Nazis attacking the Vipers. While Xavier arguing with Adama about the moral implications behind the use of time travel is pointed and interesting, the whole idea of introducing time travel to the show in the first place was pure rubbish. Especially the science behind it. While still the same basic story of what happens when you artificially enhance a culture, bad science fiction does a good job of utterly ruining what value the first part had. And I believe I speak for everyone when I say television, even in 1980, has seen enough Nazis. American TV is sadly obsessed with Nazi Germany. Star Trek did it. 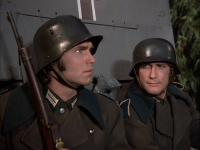 ("Patterns of Force") And even BSG 1978 did it with the Eastern Alliance Nazi allegory. The damn horse is dead, stop beating it! The story isn't completely shot to hell, however, and manages to retain at least some of the drama and intrigue of the first part. It also, fortunately, manages to tone down the late 1970s / early 1980s pop culture mannerisms that made part one of this story so annoying as well. So it's at least worth something.